ActiveExit™ is a system utility that can automatically log off users from their accounts after a period of inactivity. If you are a system administrator and users of your network often forget to log off before leaving, ActiveExit can save you quite a bit of your nerve cells. 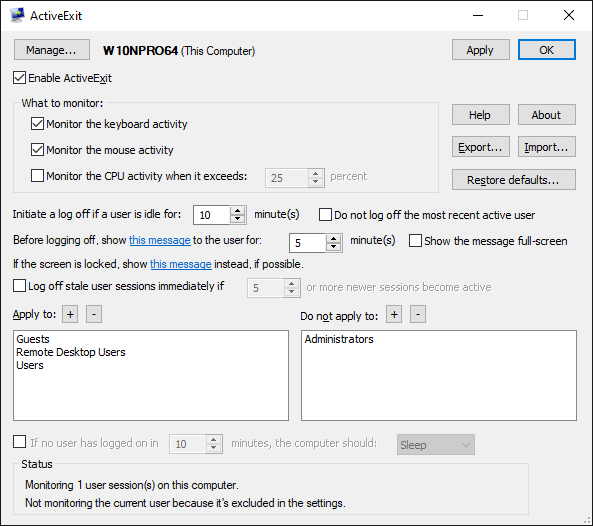 Even if the user has locked the computer, ActiveExit can log the user off after the idle period you specify, without your intervention. 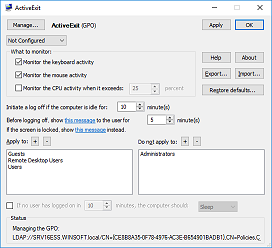 If you manage a large network of computers using Active Directory and Group Policy, you can use ActiveExit to edit a Group Policy Object (GPO) to manage all network computers from one central location on the server. What can ActiveExit do for you? 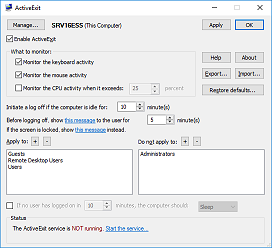 When ActiveExit is enabled, it is monitoring the user activity: the keyboard, the mouse, and (optionally) the CPU. If no user activity has been detected during the time interval of your choosing, ActiveExit displays a message to the user (for the duration of your choosing, too). If no user activity detected after that, ActiveExit forcefully logs off that user from Windows. Unlike WINEXIT and other similar utilities, ActiveExit can log off the inactive users even if the users locked their screens before leaving. (The administrator will no longer have to unlock the screens manually each time it happens). Unlike WINEXIT and other similar software utilities, ActiveExit does not replace the screensaver of the user with its own. If fact, ActiveExit does not depend on the Windows screensaver functionality at all: each user is welcome to choose any screen saver or none at all, ActiveExit will work just the same. This is a powerful feature of ActiveExit that you should consider carefully. Normally, if a user attempts to log off while there are unsaved changes to the documents, Windows prompts the user to save the changes before logging off. With ActiveExit, the automatic log off happens unconditionally, even if there are changes still unsaved by the user. The unsaved changes, if any, will be lost and the user will be logged off. After the last user has logged off, if no one logs back on to the computer during the interval of your choosing, ActiveExit can shut the computer down, sleep, or hibernate it. ActiveExit supports Windows Server 2016 (and some earlier versions, both x64 and 32-bit). ActiveExit fully supports Active Directory and Group Policy, as well as the automatic software installations with the MSI packages, that makes it easy to deploy and manage it even on a large network. You can use ActiveExit configuration utility to directly edit a GPO (without the need to mess with the ADM or ADMX files) and manage a large number of the domain computers from one central server via the Group Policy. ActiveExit comes with a built-in license that allows its free use for the personal, non-commercial purposes on up to 5 computers within the local network, and can monitor up to 5 user sessions on each computer simultaneously. If you want to use ActiveExit for the business purposes, then you can use the built-in license for the evaluation purposes only, for no more than 30 calendar days from the day of the first installation of ActiveExit. If you want to continue using it after the initial 30 days, you must purchase one of the business licenses we offer.